As I mentioned on Monday in my toddler stocking post I have a little series going on this week all about Christmas Stockings. This time we are on to the boys, especially those in the 8-10 age range. This age group can be REALLY hard to buy for. Most are ‘not really into toys anymore’ (even though they still happily play with the action men under the bed when their friends are not around!) yet they are still too young for ‘grown up’ teen/tween stuff. 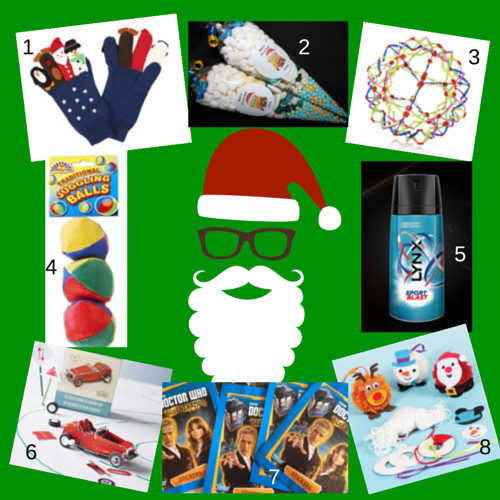 Here are the stocking fillers I have put together for this age group. To go with the obligatory Christmas socks, these gloves are just perfect! They are a little bit of fun and are quite funky all at the same time! I usually buy a few smaller cheap sweets to bulk out the kids stockings but these bags are a great alternative! And well, what more can you say than MINIONS!!!! This is a truly addictive toy! When it is in your hand it is a nice small, yet funky looking, little ball made up of what looks like plastic sticks! But throw it up in the air and it expands into a huge ball, until you catch it again and it shrinks back down! Trying to get it to stay big when you catch it again will keep anyone occupied for hours! These little balls are the ideal size to put in a stocking and are bound to be a winner as your son spends his afternoon throwing them all over the place while trying to master juggling. Be warned: you may want to move any breakables out of the room as those balls will go everywhere!!! If your son is anything like mine, he will want to be ‘just like dad’. LV is forever coming downstairs bringing a waft of his father’s body spray with him. Not that he used it of course! Some sprays can be quite strong and a bit too grown up in my eyes, so why not give him his own spray in a younger scent like this Lynx Sports Blast? Whether with help from an adult for the younger ones or buy themselves this kit will create a fun little keepsake that will keep running for a long time, or take pride of place on a shelf as it is so pretty! All kids love stickers! They are an ideal stocking filler as they don’t cost the earth and what is great is, if they don’t already own one, Santa can also bring them the album to store them in! Topps Direct have a vast selection of themes from football to Disney and everything in between. My boy is Dr Who mad and I know he would love these! To me, something crafty in a stocking is an essential! But a lot of kits can seem quite girly and put the boys off joining in (even if they really want to!) These pom pom baubles are perfect; Totally Christmassy yet with no sparkly angels in sight! What are your go-to boys stocking fillers? Disclaimer: I was sent some stickers, the expanding ball and the body spray (all chosen by me) to try for the purposes of this post. All views and opinions are honest and my own. Aren’t they fab! I must admit I’m gutted they don’t come in my size!